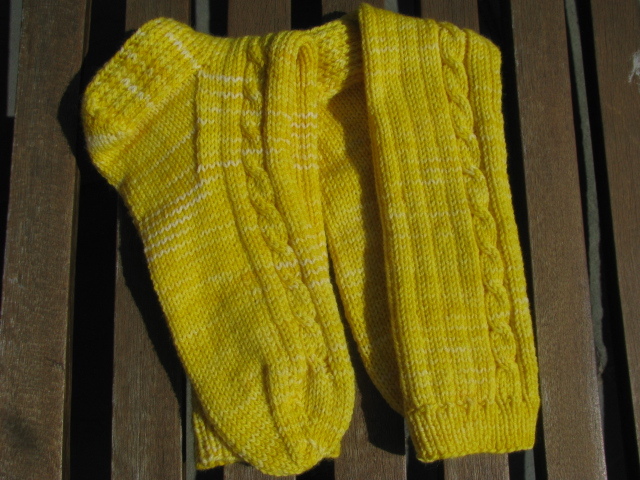 https://www.knitnscribble.com knitnscribble.com: Easy beginner sock knitting pattern - I love these socks! Easy beginner sock knitting pattern - I love these socks! There's no question of which sock belongs on left and right feet with this easy sock pattern. 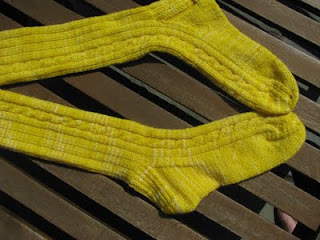 Knit with DK sock yarn, a knitting project perfect for beginner sock knitting, so much fun and a great summer project. One four stitch cable runs down opposite sides of the socks, a simple free sock pattern named just that "So Simple Silk Garden Sport Sock." 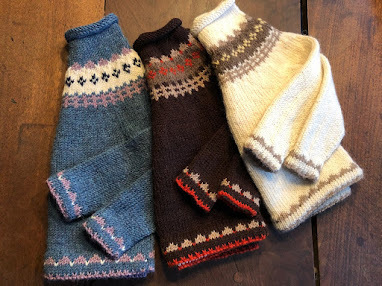 Hubby likes the tops long enough, so his leg doesn't show when he crosses them, so these tops are measuring knit cuff down about 11 inches to the beginning of the heel flap, before blocking. Knitting with DK sock yarn as a beginner sock knitter, gives the knitter quick fulfillment so you get the confidence to move on to smaller needles. If you are knitting with dpns for the first time, it's also a great introduction to double point needles. Knitnscribble used US 4 (3.5mm) for this project. If you have never knit socks before and want to give a whirl, you won't regret using this pattern. Read about how knitnscribble started the project about two weeks ago. Could have finished much sooner, but for 12 days of visiting grandchildren, which we thoroughly enjoyed. 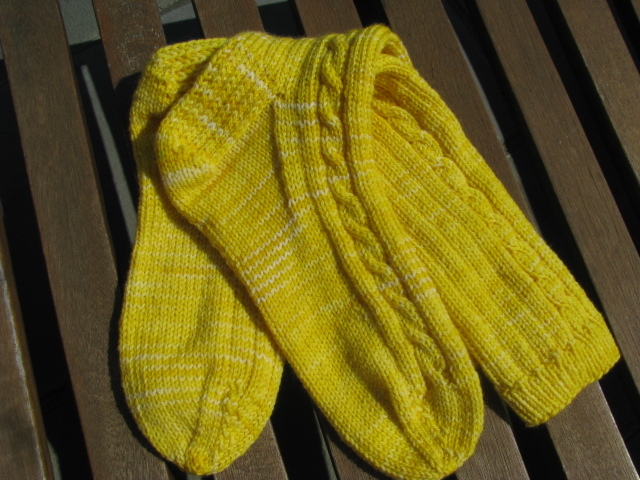 Find the So Simple Silk Garden sock pattern on Ravelry. The original sock pattern is knit with Noro Silk Garden Sock yarn. Any DK sock yarn will do for this pattern, just make sure it is sock yarn and not regular DK yarn. Sock yarn usually contains a little nylon for durability in the heels and toes. You don't want your beautiful socks to wear out too soon. Here's another free easy first sock pattern knit with US 2 (2.75mm) dpns. I like the cable pattern on these socks. The easy cable really gives this sock pattern definition and you really don't even have to look at the pattern. So simple. Thanks for commenting WildflowerWool. Oooh, love these great basics! Robin, thank you, love these, too, everything about them, the easy design, and quick fulfillment, great firsts when it comes to knitting socks for a beginner. 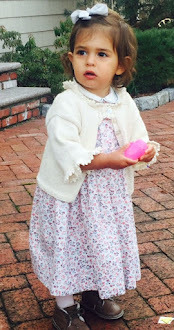 scroll on down to see her fab knitting patterns!